When all the Pi is Wrong nonsense stormed the internet I had many responses to my video and it wasn’t all just hate mail and “how did this guy get a PhD when he finds dividing by 2 difficult?”. One assertion in particular gathered a lot of interest. I got comments ranging from bewilderment to abuse. My inflammatory statement: a 50 pence coin has constant width. There is more to it than just looks. It is practical. The shape allows visually impaired people to tell what the coin is without having to carefully judge the size. (Judging coin size can be difficult – many old people suffer from both sight problems and arthritis.) Of course, if you wanted a coin that is an easily detectable shape, then why not use a square? Well, then the problem is how do you get a vending machine to detect coin values? You will need an extra mechanism to detect shapes and one to orient the coin to check its size in case it is a fake. The underlying mathematical beauty of the 50 pence is that wherever you measure its width it is the same and hence the extra mechanisms to detect shape and change orientation ready for measuring are not needed. And a simple mechanism means lower maintenance and more reliable working. 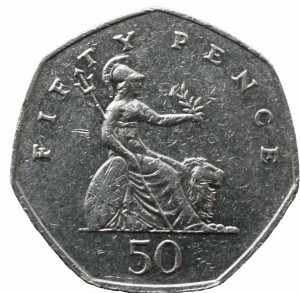 If you don’t have a 50p coin and calipers to hand to check my assertion, then it is easy to construct a non-circular shape with constant width. 1. Take a compass and draw half a circle. 2. 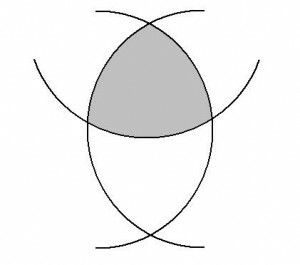 Place the compass sharp point at the centre of the half circle — and not changing the radius — draw another half circle. 3. 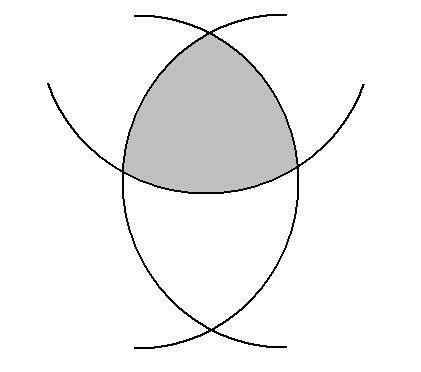 Now, again not changing the radius, at an intersection point draw another arc (doesn’t have to be a half circle). You now have a curve of constant width. Perhaps even more surprising is that the idea works with solids as well, i.e., there exists solids of constant width that are not spheres! See the resources below. How Round Is Your Circle? book by John Bryant and Chris Sangwin. Interesting paper! Have you tried something similar for surfaces? After all you can find solids of constant width. In fact you can even buy them from Maths Gear http://mathsgear.co.uk/products/solids-of-constant-width!